Join Thames21 and London Borough of Ealing Council for a guided walk about the exciting improvements in and around Perivale Park. 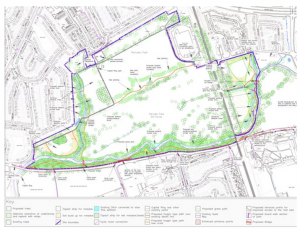 Do you wish to know: what improvements are taking place to the River Brent; why they will improve the local habitat; what features will be added to make the park more accessible; how the project will reduce flood risk in the area? Then please do join us for this guided walk. All welcome. Under 16’s need to be accompanied by a responsible adult. Looking forward to seeing you by the river bank.